So it looks like the medical rationale is beginning to heat up interest in the remote presence space (or “virtual presence” as Anybots and Sheldon call it). In time for the American Telepresence Association 2013 conference, Anybots and Polycom announces a partnership to offer the Polycom medical video solution. The intriguing question is, can a partnership between Anybots and Polycom compete with the likes of InTouch and iRobot? 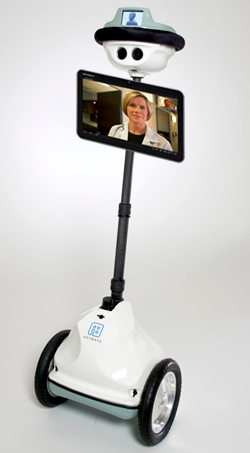 InTouch has spent countless years developing a remote presence solution that brings the doctor directly to the hospital bed of a patient, whereas Anybots is providing a solution designed for nurses and PAs to offer after outpatient services to reduce readmission rates. The question is — will this be a valuable market? Only time will tell. Polycom, Inc. (Nasdaq: PLCM), the global leader in open, standards-based unified communications and collaboration (UC&C), today announced alliances with robotics innovator Anybots Inc. This entry was posted in Anybots, Anybots QB, Health Care, Industries, Remote Presence News, Remote Presence Systems, RPS Companies and tagged Anybot QB, Anybots, medical telepresence, Polycom, remote presence, virtual presence. Bookmark the permalink.